A ring tells a lot about the wearer — his sense of style, values, traditions, and even his marital status. It can be aesthetic in function or symbolic. Be it simple or intricate, a ring can look extra special when worn. Birthstone rings, engagement rings, and wedding rings are some of the most popular types but there are still plenty of other kinds you need to know. Promise Ring. This ring usually comes in small sizes and usually indicate a monogamous relationship. Some promise rings serve as a precursor to engagement rings but others don’t. Some complementary and identical promise rings can be a symbol of everlasting friendship. Others are even a sign of a religious or personal commitment to follow certain principles and rules. Birthstone Ring. A ring that has precious or semi-precious gemstones that are connected with the month of a person’s birth. This is a meaningful and a personalized ring and is considered special for the wearer. Fancy Wedding Band. This wedding band has a more decorative style than a plain, traditional precious metal band. Some wedding bands have engravings while a few others are etched with gemstones. Cocktail Ring. Cocktail rings are large and dramatic and are very eye-catching. They originated in the 1930s and worn at cocktail parties. Cocktail rings are usually engraved with plenty of big, imitation gems and little faux diamonds. The idea is to make the gemstone look overdone and lavish. Engagement Ring. This ring is traditionally presented to a woman by her fiance when he is about to marry her. Worn on the left finger, engagement rings have either diamonds or gemstones like sapphires and rubies. Anniversary Band. Anniversary rings are oftentimes etched with diamonds which are placed in a channel or prong setting. The band can either be tapered or uniformed. But there are certainly no set of rules. This kind of ring is given on a wedding anniversary. Fashion Ring. This ring is worn solely for fashion purposes instead of indicating an important event. The design may vary depending on the latest trend. Estate Ring. A ring that was formerly owned and part of a deceased person’s estate. Some rings can be antique while others may be costume rings from a different time period. Signet Ring. Also called a “seal” ring, this ring is engraved with letters particularly the owner’s initials. Some signet rings feature a specific design. Examples of signet rings are college rings. Bridal Set. This is a set of rings that include an engagement ring and a wedding band. The ring is worn by a married woman on her left ring finger. The rings when worn are usually stacked together with complementing styles. Eternity Band. This band is uniform in width and has one or more continuous rows of uniformed diamonds or gemstones. The stones that surround the band are prong or channel set. 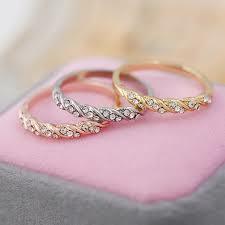 The husband usually gives an eternity band to his wife on their wedding anniversary. Puzzle Ring. Originated in the 17th century in England, Germany, Italy, and other countries, puzzle rings are formed from multiple bands that are placed together in a specific way that make them look like a single ring. A ring doesn’t only only adorn your finger but has a sentimental or traditional value. With the pointers above, here’s hoping you can find a ring that best compliments your fingers. While you have plenty of choices, be sure to choose one that would suit you both in style and shape. This is just part 1 of the different types of rings. Be sure to stay tuned for part 2 as there are still other types of rings that might tickle your fancy! This entry was posted in Bead Facts. Bookmark the permalink.